Fall has reappeared here in our neck of the woods, and the rains that have accompanied it have washed away all signs of the snow that fell earlier this week. Many of the leaves on the trees have turned a brilliant gold color, and the temperatures have climbed back into the 50’s. We’re supposed to get another chance of snow falling next week, but for the time being, I’m enjoying the reappearance of Fall. To welcome back the Autumn season, however brief it may be, I decided to make this incredibly yummy Gingerbread Apple Crisp. 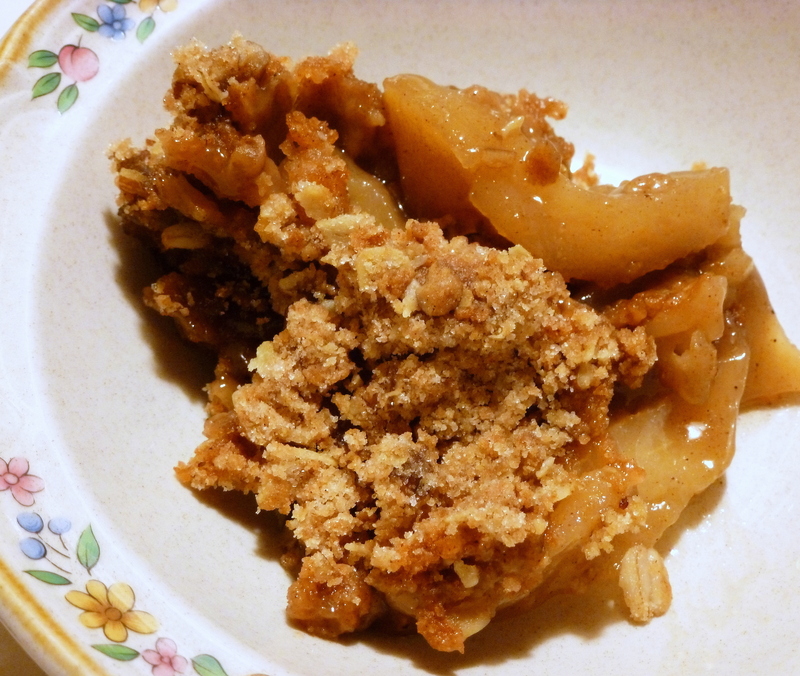 Now I’ve had plenty of apple crisp throughout the years, but this recipe is one of my favorites. I’m not sure what makes this apple crisp so good. It could be the allspice and brown sugar that wraps around and coats each and every apple slice, or it may be the gingerbread pudding mix, oats, and pecans that combine to create the crisp and delicious topping. Whatever it is, I really love it. If you’re not a big fan of gingerbread, you can get creative and try this recipe with other pudding flavors such as vanilla, cheesecake, pumpkin-spice, etc. Whichever flavor you like and think would pair well with apples. Preheat oven to 350 degrees. Place the apples in an ungreased 8-inch square baking dish. In a medium bowl, whisk together the brown sugar, cornstarch, allspice, vanilla and water. Pour over apples. In a large bowl, combine oats, flour, pudding mix, sugar, cinnamon, salt and pecans. Cut in butter until mixture resembles coarse crumbs. Sprinkle over apples. Bake for 45-50 minutes, or until topping is golden brown and fruit is tender. Remove from oven and place pan on wire rack to cool slightly. Serve warm with ice cream or whipped topping; if desired. Even though these tasks are keeping me pretty busy this weekend, I still wanted to take some time to whip up a quick dessert for dinner tonight. This Easy Dutch Apple Pie couldn’t be a more perfect dish to make when you only have a short amount of time. The oatmeal crust and topping combine together in a jiffy, and makes a wonderful base for the apple filling. The taste is pretty similar to an apple crisp, but in pie form. I purposely used a sugar-free apple pie filling, in order to make my pie a little healthier, but you can certainly use the regular apple pie filling with sugar added, if desired. Well, it’s time for me to get back to work. Enjoy the rest of your weekend everyone!! In a large bowl, combine the flour, brown sugar, oats, and butter until crumbly. Set aside 1 cup for topping. Press remaining crumb mixture into an ungreased 9-inch pie pan. 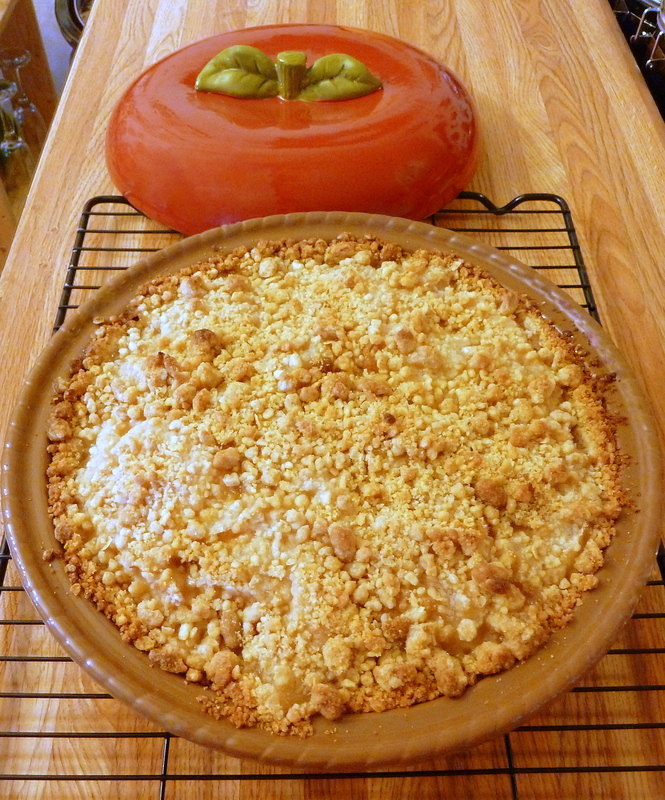 Pour apple pie filling into crust; top with reserved crumb mixture. Bake for 40-45 minutes, or until crust is golden brown. Remove to a wire rack to cool. Autumn is in full swing here in Alaska and now that the storms have passed, I’m continuing my Fall baking with these incredibly flavorful and very yummy Caramel Apple Cookies. I hate to admit it, but sometimes I can be a bit lazy when it comes to baking. I really wanted to make a caramel apple cookie, but I didn’t want to use those individually wrapped Kraft caramels, because I didn’t want to mess with unwrapping them. Yes, I know… that is pretty lazy, because those caramels are not that difficult to unwrap. Anyway, I took a trip to the grocery store and started browsing through the baking and candy aisles to see if there was something else I could use. That’s when I stumbled upon a package of Hershey’s Rolo Minis. I couldn’t see through the bag, so I couldn’t tell how big the candies were. They did have a picture of a caramel candy on the front of the bag that stated “actual size”, but I’ve learned from experience that those pictures are not always accurate. I decided to test my luck though, and I purchased a bag anyway. When I got home and opened the bag, my first thought was that the candy might be a tad too big to use in the cookies, but I decided to mix them into the batter anyway. After they finished baking, I was thrilled to see that the cookies turned out great! The caramels melted a bit, but held their shape pretty well. 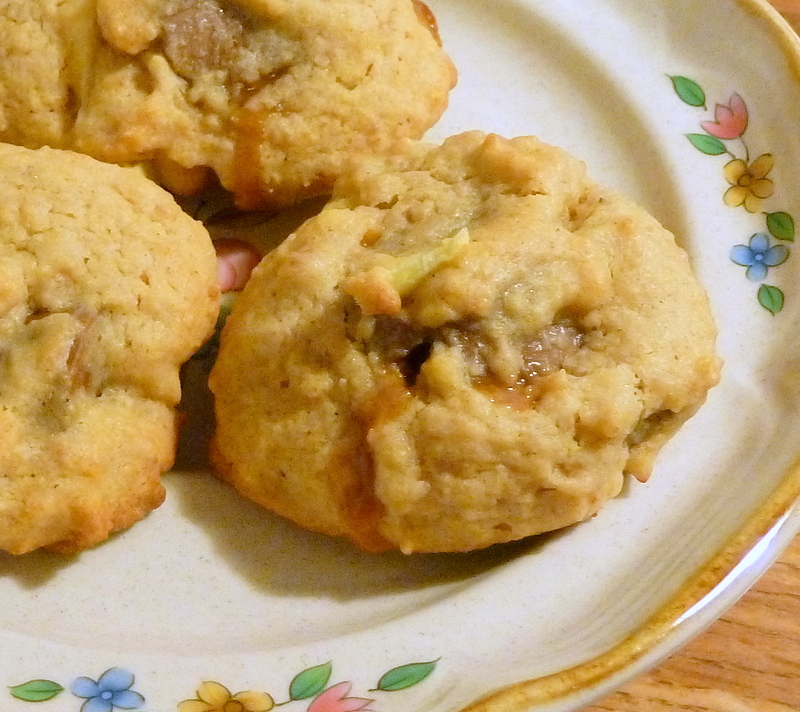 The cookies were soft, and the chocolate caramel flavor paired beautifully with the apple. The graham cracker crumbs also added a delightful texture and taste. These cookies are the perfect treat to enjoy on a Autumn day. I better enjoy them quickly though because, even though we’re only one week into the Autumn season, I can tell that it won’t be long before snow arrives, and then it will start looking more like Winter than Autumn around here. In fact, the weather forecast is calling for a mix of rain & snow to fall this weekend. If the wind doesn’t howl and the rain doesn’t cause any more flooding, I guess I’m okay with a bit of snow falling – as long as it doesn’t accumulate. In a medium bowl, combine flour, graham cracker crumbs, baking powder, salt, and apple pie spice. Set aside. In a large bowl cream butter and sugars together until light and fluffy. Beat in eggs and vanilla extract. Gradually add dry ingredients and mix well. Peel, core, and dice apples into small pieces. Fold apples and Rolo Minis into dough. Drop batter by rounded tablespoonfuls, 2 inches apart, onto prepared cookie sheets. Bake for 10-12 minutes, or until lightly browned. Remove to wire racks to cool. With the daytime temperatures nearing 50 degrees and the snow rapidly melting, I’m starting to get excited for the first day that I head out for my favorite Spring & Summer activity – hiking! We have a lot of beautiful hiking country here, and nothing reduces my stress level more than being out in a remote area, where all you can hear is the wind blowing through the trees and the water flowing in the streams. The apple and chocolate flavors pair very well together, and the oatmeal adds nutritional benefits like fiber and protein. You can be sure I’ll be packing some of these treats with me when I head out into the back-country on my first hiking trip of the season. Preheat oven to 350 degrees. Spray a 8 x 8-inch baking pan with nonstick cooking spray. In a large bowl, whisk the oil, applesauce, and brown sugar together until well blended. Add egg, milk and vanilla extract; whisk until combined. Add the flour mixture and stir just until moistened. Fold in the oatmeal and chocolate chips. Spread batter evenly in prepared pan. Bake for 15 to 20 minutes, or until light golden brown. Remove from oven and cool on a wire rack. Cut into squares. I’ve been feeling a bit under the weather for most of the week, so I haven’t been doing much of anything except resting and trying to get healthy again. Even though I’m not quite feeling 100% yet, I was really hankering for a fresh-baked treat, so I decided it was time to do a little baking. I’ve had one lonely, large apple sitting on my kitchen counter for several days now, and I really needed to use it in something. 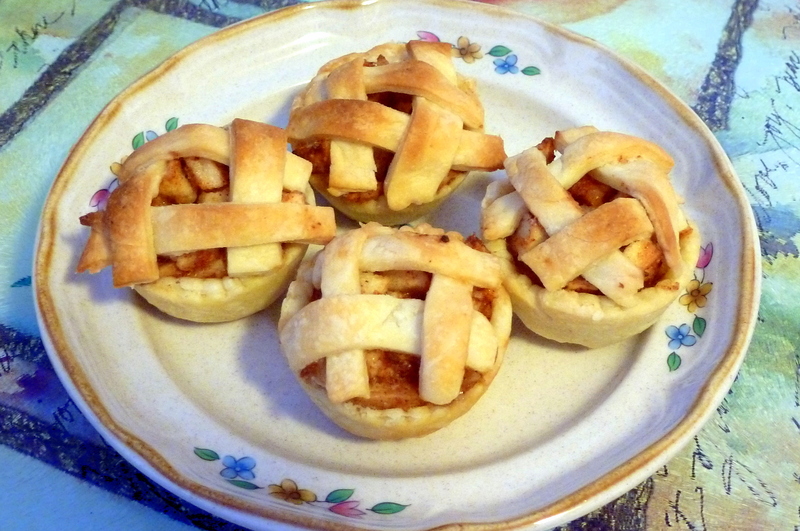 That “something” turned out to be in these Miniature Apple Pies. These bite-sized little pies are wonderful to snack on when you just want a little something sweet, but you’re not quite hungry enough to eat a whole piece of pie – which is exactly the way I’ve been feeling this week. Preheat oven to 400 degrees. Grease and flour a 12 cup mini muffin pan. Place pie crust mix in a small bowl. Sprinkle water (one tablespoon at a time) over mix while tossing with a fork, until moistened. Form dough into a ball. Flatten into round on floured surface. Roll dough to a thickness of 1/8 – 1/4 inch. Using a medium-sized biscuit cutter, cut 12 circles from rolled out dough. Press one circle into the bottom and up the side of each muffin cup, to form little bowls. In a medium bowl, combine diced apple, sugar, cinnamon and flour. Place a spoonful of apple mixture into each miniature crust. Cut butter into 12 little pieces and place one piece on top of each pie. Decorate the top of each pie with any remaining pie crust pieces, or leave plain. Bake for 18-20 minutes, or until crust is light brown and apples are bubbling. Wish you could sneak a few more veggies into your children’s, or even your own, diet? Well these Oatmeal Chocolate Chip Carrot cookies just might help. 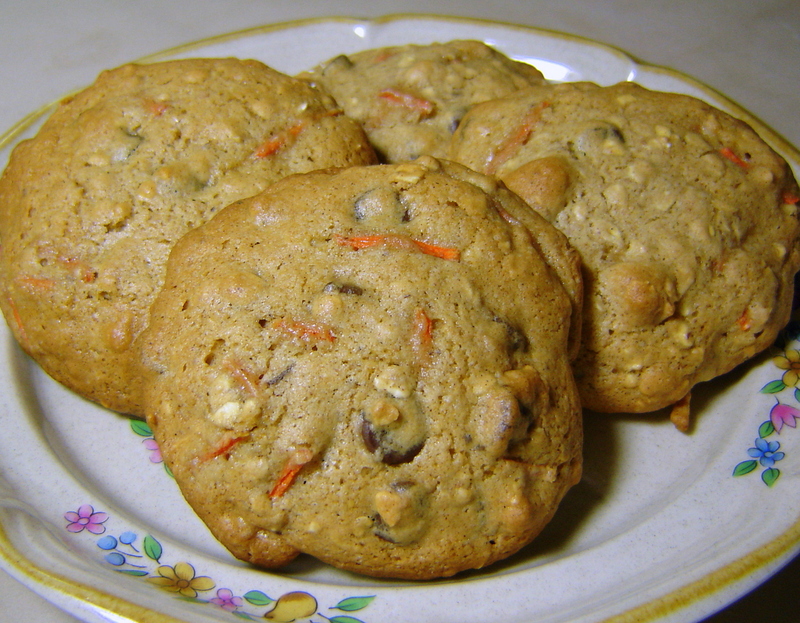 Not only are these cookies packed with 100% whole grain oats, but there’s also a full cup of carrots mixed in. In a large bowl, beat brown sugar and oil until blended. Beat in eggs and milk. Gradually add dry ingredients and mix well. Stir in chocolate chips, oatmeal and carrots. 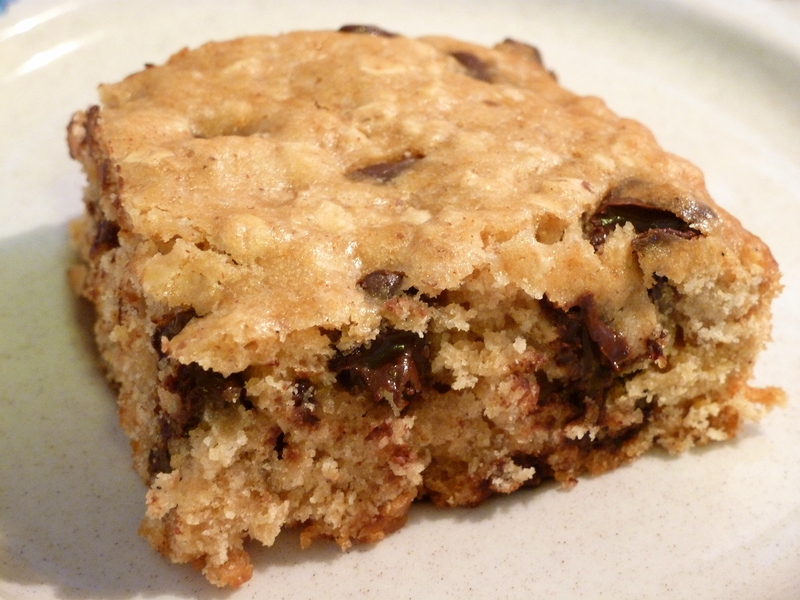 Drop by heaping tablespoonfuls onto cookie sheet. Bake for 10-13 minutes, or until golden brown. Let cool on cookie sheet for 1 minute, then remove to wire rack to cool. The temperatures have really started to drop here. Earlier this week, the temperatures were in the 40’s. Now they are in the 20’s. It hasn’t snowed yet, but they are saying that it may this weekend. I’m not really quite ready for snow, but I suppose it’s bound to happen sooner or later, and the cooler temperatures do make me want to bake more. Today I had one lonely Granny Smith apple sitting in my fruit bin, that I had no idea what to do with. 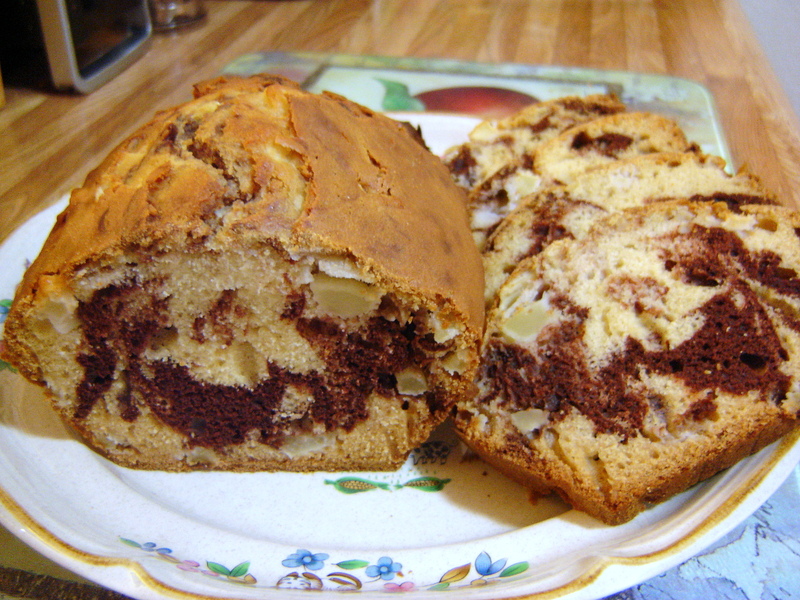 After combing through several recipe books, I finally decided to use it in this Marbled Chocolate Apple Bread. The recipe is adapted from a Cinnamon-Swirled Quick Bread recipe that I posted on this blog a few years ago. The apple and chocolate flavors pair well together in this bread, and some of the apples even retained their firmness, which adds a delightful crunch. It’s a perfect bread to enjoy with a nice cup of hot coffee or tea on a chilly day. Preheat oven to 350 degrees. Grease and flour a 9 x 5 loaf pan. In a large bowl, beat sugar and oil. Add egg, 1 cup milk, and vanilla extract. Beat until combined. Gradually add dry ingredients and stir until moistened. Remove 1/2 cup batter and place in a small bowl. Add baking cocoa and 1/2 tablespoon milk to batter. Stir until combined. Spoon half of the batter into prepared loaf pan. Spread cocoa batter on top. Cover with remaining batter. Cut through batter with a knife to swirl. Bake for 55-60 minutes, or until toothpick inserted in center comes out clean. Cool in pan for 5 minutes. Remove to wire rack and cool completely.